43 Marion Ia Dec 8th 1919 Cary Club met at the home of Mrs A L Blinks Club was called to order by Pres. Mrs Alexander. Twelve members & one visitor Mrs M Noris present. Roll call was ans'd by quotations. Minutes of previous meeting read & approved. President urged delegates to attend the meeting of City Fed of Womens Clubs, to be held Dec 9th. 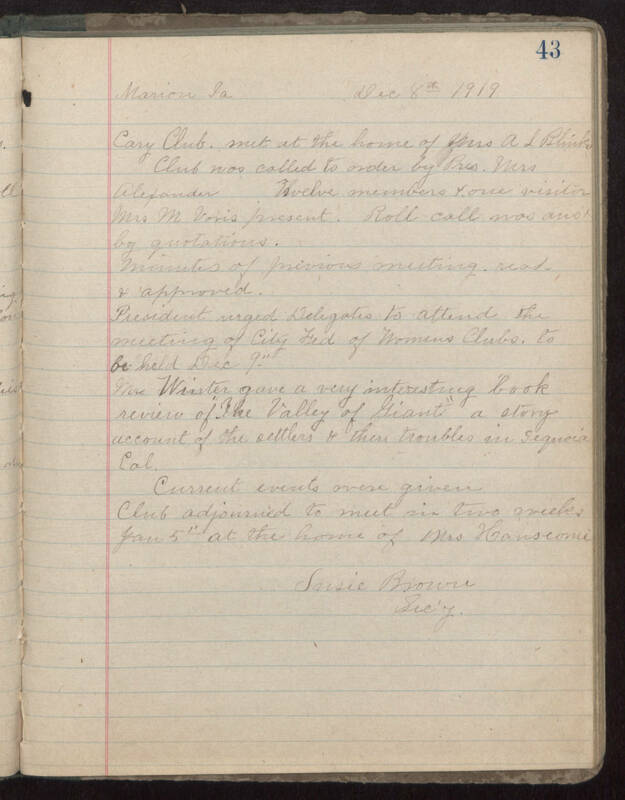 Mrs Winter gave a very interesting book review of "The Valley of Giants" a story account of the settlers & there troubles in [illegible] Current events were given Club adjourned to meet in two weeks Jan 5th at the home of Mrs Hanscome Susie Brown Sec'y.